In the era of globalization and worldwide migration many people are living in countries and continents other than the ones in which they were born or of which they are nominally citizens. Exile may be the most radical form of migration. Exile is a common term in our everyday language. But what exactly is the significance of this term? The word exile is derived from „ex(s)ilium“ in Latin and means place of banishment. Life in exile is a state of limbo especially with regard to time and space. The past lies in the country that has been left, the present is the community of exile and the future is the imagined return to the homeland. The loss of the home is partly compensated through a metaphorical return to their homeland. Home and life in a foreign country are the motor of Behruz Heschmat’s artistic works. 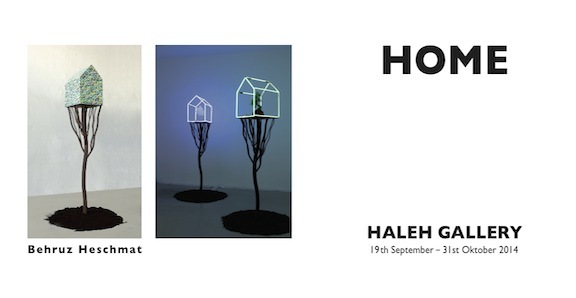 Within the exhibition Home at Haleh Gallery the artist shows sculptures of his series Treehouse. Very different model houses emerge from the earth, supported by a tree-like structure. The houses serve as metaphors for home and make it clear that the term home has no constant values. Rather is home a variable size, which may contain an arbitrary amount of elements, such as religious elements embodied by Jesus or Buddha. Behruz Heschmat deals also on an artistic level with his home country Iran, because his inspiration for this series stems from the film „The house is black“ by the poet Forugh Farrokhzad. This film is for the development of the Iranian cinema of major importance and is regarded as founding document of the Iranian New Wave Cinema. The filmmaker and artist has documented in her film with semantically strong images the life in a leprosy colony. „ (…) home is where my heart is“, states Behruz Heschmat. If we look more closely at the artistic works by Heschmat, we realize that he uses the term home in a variable sense, but nevertheless his roots are to be localized. Behruz Heschmat (*1953 Tabriz, Iran) lives and works in Vienna as freelance sculptor. 1970 – 75 Sculptor in Tehran. 1976 – 82 studied at the University of Applied Arts in Vienna with Wander Bertoni. Price for small sculptures, Biennale in Gabrovo, Bulgarien (1981); Anna Sussman Price (1991); Golden honor medaille, Künstlerhaus Wien (2005). Installation „Borders“, Künstlerhaus, Wien (2001); group exhibition Lukas Feichtner Gallery, Vienna (2013); solo exhibition „The House is black“, Rose Issa Projects, Frieze Art Fair, London (2013), etc. We cordially invite you and your friends to the 4th anniversary of Haleh Gallery and to the opening of the exhibition on Friday, 19th September, 2014 at 6 pm. The artist Behruz Heschmat will be present at the opening. We look forward to seeing you! Opening Hours:Thursday – Friday 11:00 to 16:00.Wednesday and Saturday by appointment.